Hello sweet ones! It's a cold and dreary day outside here in Sydney, however, I am so ready to get stuck into God's word with you. This week we're up to John 17 in our Jesus 101 series and this is perhaps one of my favourite glimpses into Jesus's life as he reveals to us the importance of prayer. You see, Jesus knew He had but hours to live - but instead of moping or rebelling or crying Himself to sleep, he took the time out to pray with His disciples. When you think about it, when we know death it tends to bring our priorities into focus. All of a sudden we figure out what's really important in life and who really means the most. 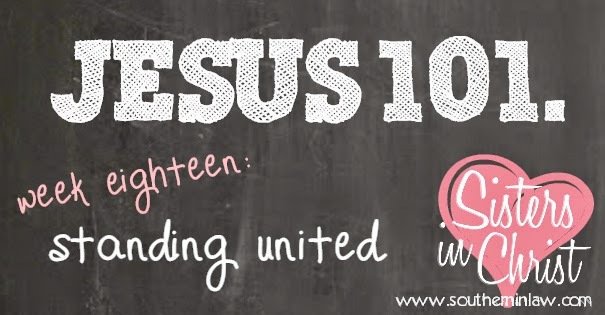 But today, I want to focus on one very thing that Jesus prayed for us - unity. Jesus could have prayed for anything that night, but instead His prayer was dominated by one single thought - unity. Jesus knew that the church would never make an impact on the world unless the world saw unity and oneness in that church. He knew that it wasn't an easy task in itself - but He knew that it was needed to make the impact He desired. First Jesus prayed for unity for His disciples - without unity, they would never be able to share the Gospel in a convincing way. Think about it; If one man or woman approached you in the street today and told you about this incredible saviour that they knew and you'd never heard a thing about - you'd probably think they were bonkers right? There were incredible tensions in the group of Jesus's disciples - but Jesus prayed for their unity and the unity of all believers to come. Jesus asked for God to give us unity as a request - that means that unity is given and not achieved. The unity of the church is received. Just as Jesus is in the Father and the Father is in Him - so are we to be related in the church. As Christians, we tend to find we're drawn to one another because we're drawn to one common thing. As human beings, generally speaking we're all drawn to our friends because we have something in common. The people of the church are drawn together because they are drawn to Jesus Christ Himself. He is the source of the power of that unity. Not only does Jesus pray for unity, He prays for the impact of a united church. That impact is that the world believes God the Father sent Jesus into the world. Only the obvious unity of believers will convince the world of Jesus. Haven't you ever heard the saying "You're the only Bible unbelievers read?" Only the sight of a united church will convince the world of the truth of Jesus's message and mission. They say power is in numbers - but the truth is power is in unity. I think the easiest way to think about the unity of the church is to think about a brand new box of lego. They're all different in colour, different in size and different in use - but they all go back into the box together and they're all designed to fit together. As Christians, we're all very different. We have different experiences, different worship styles - even different believes to how we should love. There are some of us who are new to our walks with God - and others who have been walking the walk for dozens of years. Some of us have endured pain and suffering and our pieces are chipped and cracked - whilst others are bright, shiny and new. If the lego pieces refused to accept their differences and get back into the box with the different colours or shapes or sizes, the unity would be lost... right? But the unity of the church isn't just important in the church - but outside of it. If you head to work during the week and whinge and whine about your church and fellow brothers in sisters in Christ - no one is ever going to accept the invitation to join you, are they? (Well, unless they like observing conflict or want to see if that person really is as bad as you say). What we do outside of the church makes as much impact, if not more, than what we do inside. It's what others see us doing that either opens their ears to hear the gospel - or deafens them. As a united church we need to stand as one. That means not whining about those who you stand with each Sunday - we need to guard our lips and realise that we are representing the church with our every action - not just what we do on a Sunday. What does that mean for our day to day lives? We need to start acting in unity. We need to think about our actions both inside and outside the church and how that affects our task of creating more disciples for Jesus Christ. We need to look to Jesus to be drawn to one another. We need to remember that whilst we're all different and have different views, experiences, emotions, thoughts, ideas, attitudes - we're all united by one incredible thing. We need to pray that God will help us to achieve that sense of unity through our own efforts in the hope of a ripple effect in the greater church. We're all united by Jesus - and we're doing this for Him. What ways can you be more unified in the church? You're absolutely right - there are fundamental truths to Christianity. We all have our different personalities, backgrounds interests, and even worship styles. But it is these fundamental truths we have in common that unite us. And since it is the biggest and most important thing in our life, sometimes just having Christ in common is enough for a wonderful friendship too, despite other differences we may have. Yes! Having Christ in common really is such an incredible thing to build a friendship on. Some of my closest friends are Christians who I probably would never have socialised with if it weren't for Jesus!